I’m in love with purple leaves and a shining farmer. 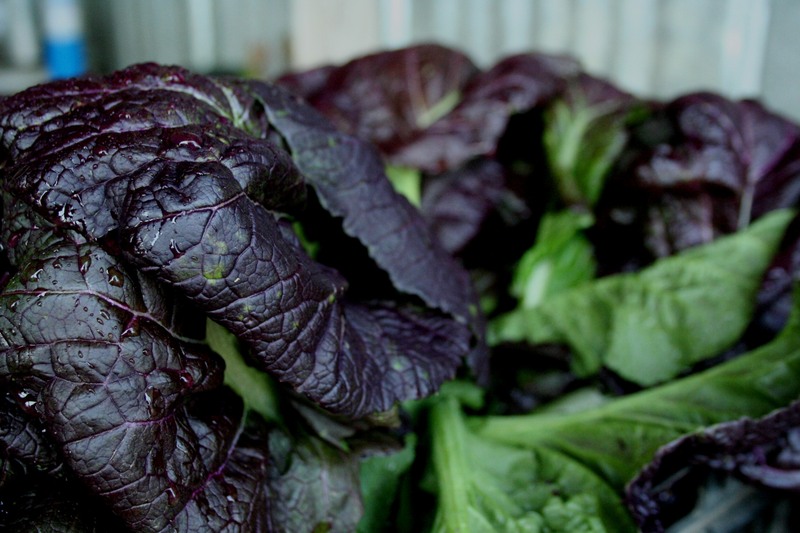 Sometimes, the joys that come from this journey of farming and loving and life are the small and random things, like falling in love with the color of these Osaka purple mustard greens. So gorgeous, you salivate at the site of them, ooh and awe all through the washing and bundling of them, take a whole slew of pictures of them, hoping to fully capture their unreal–but so real–beauty, and with inspiration, conjure up metaphors of food as poetry. You want every meal to be a work of art, all the tastes on your tongue, sublime. And with ingredients this fresh and flavorful and pretty, they are, even when most of the time the cooking here is more slap-dash than slow and meditative. 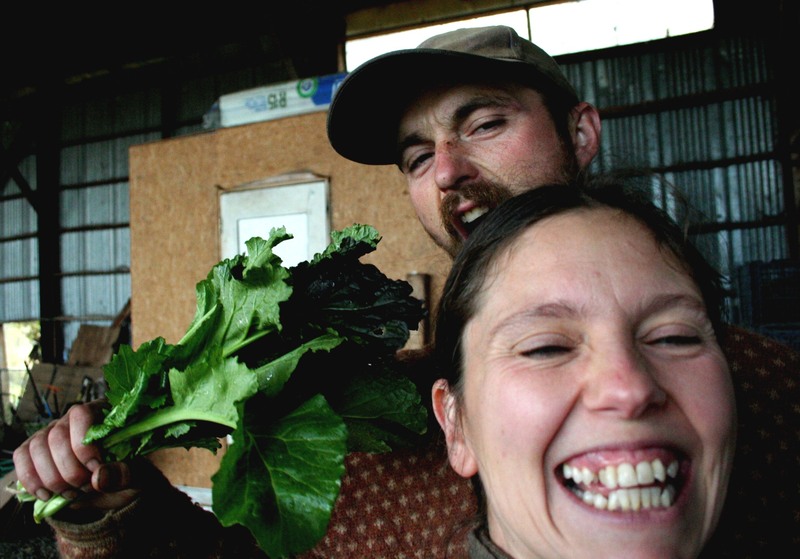 This small bit of grace– amazing food–a substantial joy we get to experience and share thanks to this farming gig. 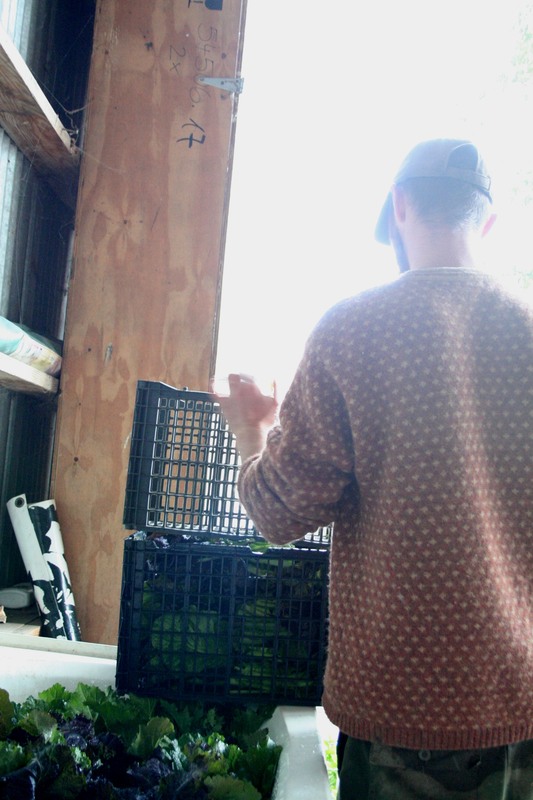 But what my heart is equally filled with today is this tiny moment of silliness between the farmer and I, as we washed these beautiful mustard greens (please forgive the poor quality of the photo and the less than flattering neck cropped and eyes half closed pose I’ve captured of myself). Starting and running a business together, one that is almost completely centered around our home, is not without challenges. But over the course of the years, working side by side with my best friend has almost always been a joy. There are stressful moments, no doubt; but we learned in our first few years of doing this that those could either be moments to divide us or moments that allow us to lean on each other even more. We are, after all, in it together. We can commiserate. And we can play. Working together is different than anything else we do together. And maybe after a long day harvesting for the farmer and a rush to finish washing everything for CSA pick up and market the next day since we have plans for a once in a blue moon night out together, you goof around just a bit, to lighten the mood. To not worry about getting it all done, to enjoy being together. And we did and do. Tiny moments and leaves cut from the ground. Nothing much, but everything in the world.